Can East Coast wine compete at the level of more established West Coast wines? 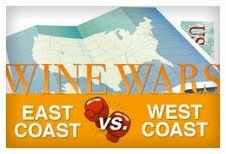 “In the hip-hop industry, an ongoing East Coast-West Coast rivalry has divided artists and fans alike. It’s an ongoing battle that has led to infinite heated college dorm room exchanges. In the saddest of cases, it’s led to the death of iconic rappers, the Notorious BIG and Tupac Shakur. No such rivalry exists in the wine game. The West Coast has long reigned supreme. With California’s big Cabernets, Oregon’s silky Pinots and Washington’s big-yet-balanced Bordeaux styled blends, there’s really little room for argument. Outside of New York’s Finger Lakes Riesling, East Coast wines simply don’t stack up to their West Coast counterparts.